Knitting is a skill that people of all ages can enjoy. If you know a young child who's interested in learning the craft, choose Knitting materials that they can comfortably handle. Show the child a few basic stitches and help them knit a few sample squares. When the child is ready to knit on their own, start them on a basic project so they can gain confidence. Select yarn that's easy to work with. Pick a yarn that's comfortable and thick enough to handle such as a high-quality wool. Consider using light-colored yarn so the child can see the stitches easier. Don't teach with a thin or glittery yarn, since it can be difficult to see the stitches. Choose a yarn that's thick enough to hold between your fingers easily. Thin yarn is more likely to become tangled and the child might drop stitches more often. Let the child choose needles that are easy to handle. 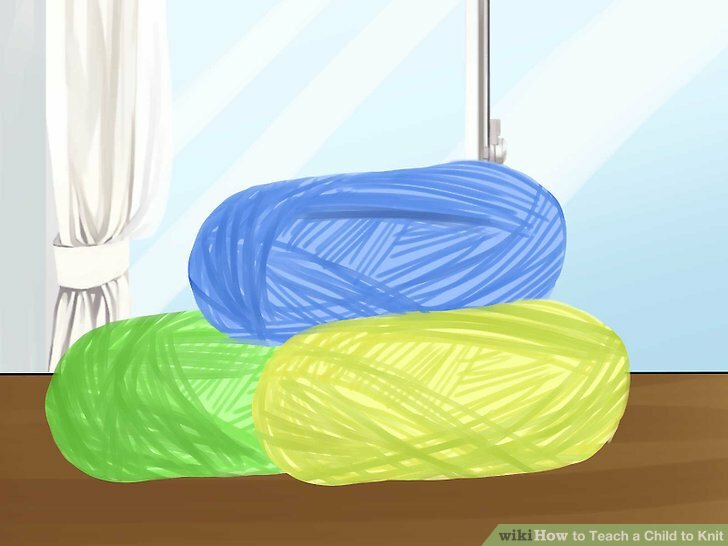 Use any size of needles as long as they work with the size of the yarn. For example, if you have thick worsted wool, use larger knitting needs such as US size 7. You can buy metal, plastic, wood, or bamboo needles so ask the child which type feels the most comfortable and use those. Bamboo and wood may be more comfortable to work with because they'll warm up between the child's hands as they knit. Some children prefer thinner needles while other kids find that thicker needles are easier to grasp. Keep the teaching session short enough to match the child's attention span. 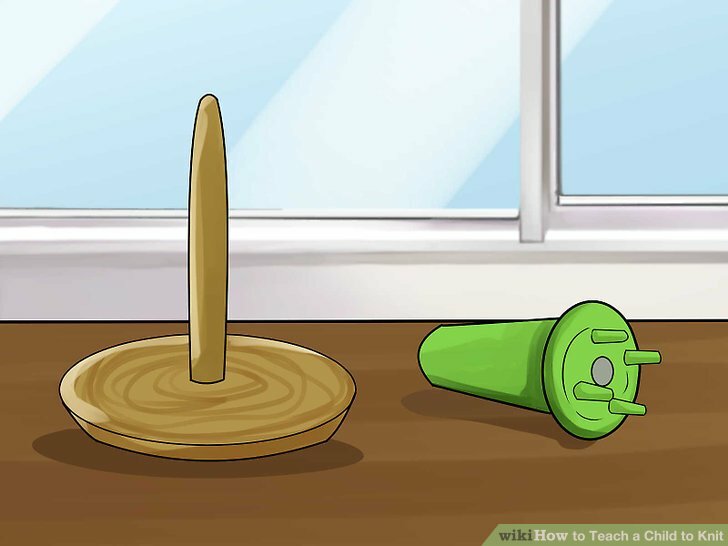 To determine how long to make the lessons, add 2 to 5 minutes to the amount of the child's age. For example, if you're teaching a 5 year old, keep lessons between 7 and 10 minutes long. Limiting the sessions will help the child focus and will prevent them from getting bored or disinterested. 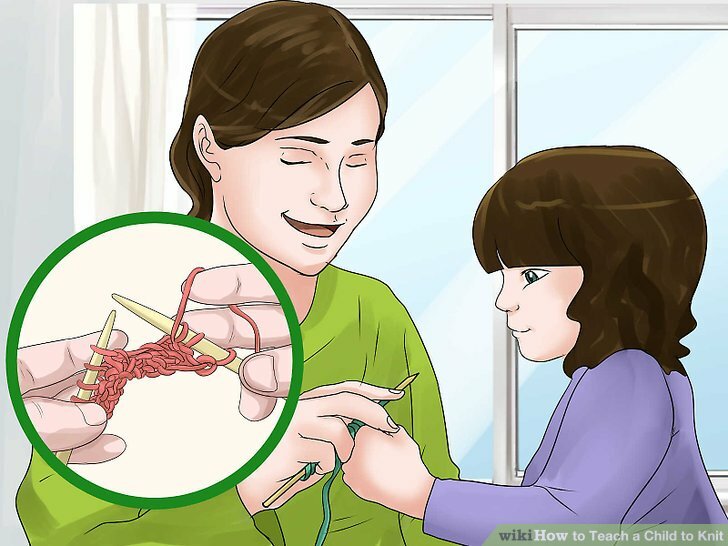 Show the child how to finger knit. 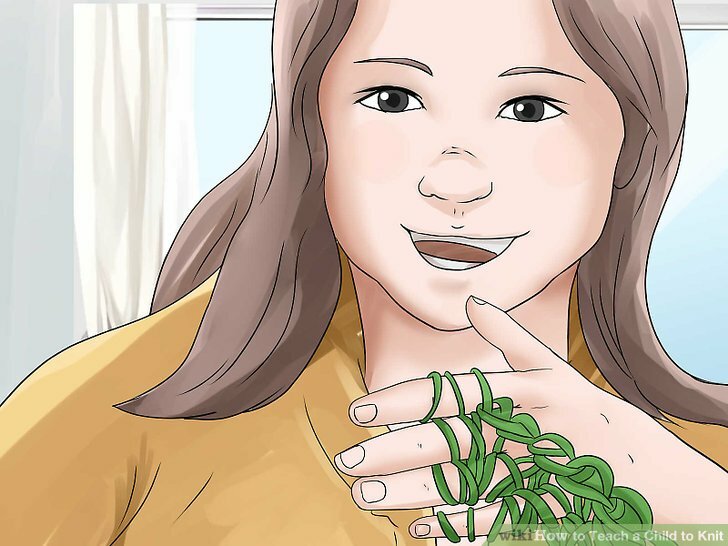 Before you introduce the knitting needles, teach the child how to hold the yarn and knit a basic chain using just their fingers. 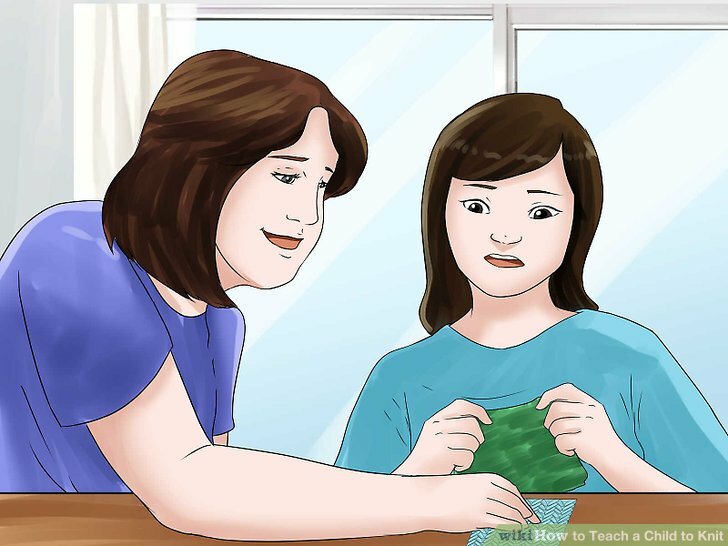 The child will get used to handling the yarn and will gain confidence when they see that they're knitting a chain. You don't need to have the child make anything using the chain. Instead, they can simply practice weaving with the yarn and you can see how well they do with following basic instructions. Teach the child to use a knitting knobby or loom. If you don't think the child is ready to hold needles and begin knitting, start them on another tool that will make them familiar with yarn. Buy a knitting knobby, knitting spinner, or knitting loom from a craft supply store. 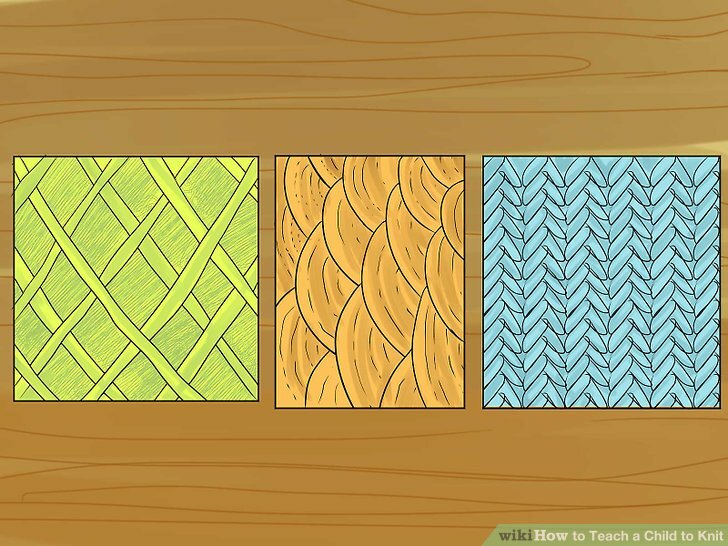 Show the child how to weave the yarn around the tool to create basic knit patterns or swatches. These tools are great if you've offered the needles to the child, but they kept dropping them. 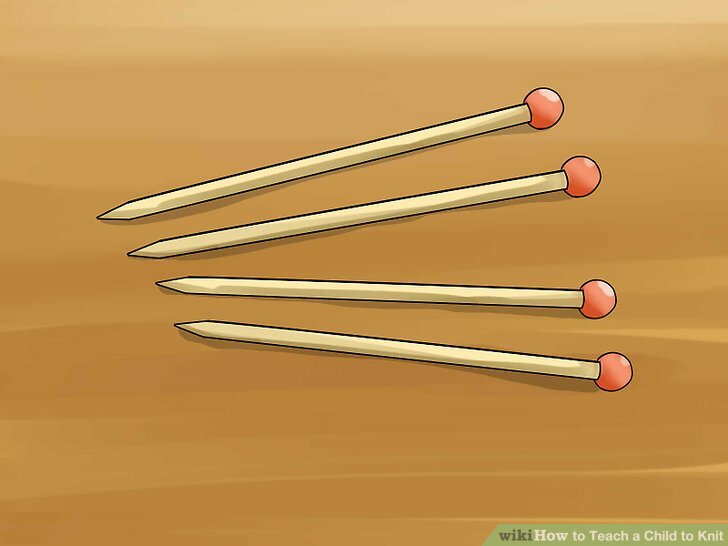 Use knitting needles to teach the child the knit stitch. Once you think the child is ready to use the needles, cast on and knit a row of stitches for the child. Then, show the child how to insert the needle into the stitch to create a new knit stitch. 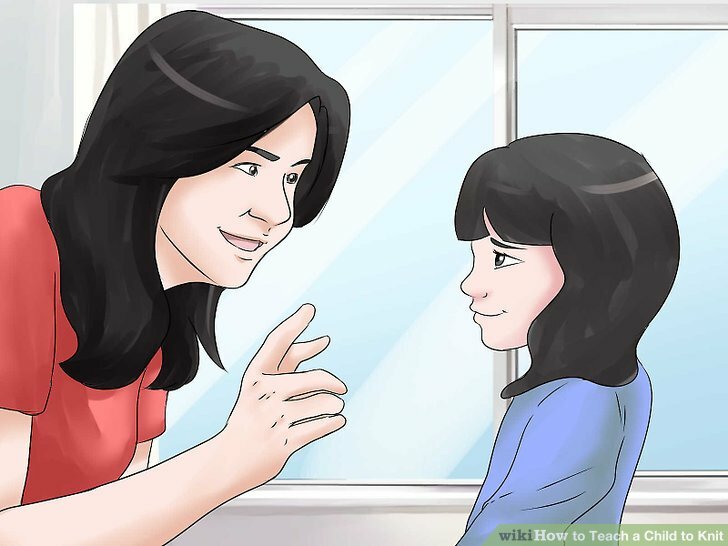 Have the child watch you do this 5 to 7 more times. Go slowly and ensure that the child can see you insert the needle and loop the yarn around it. Let the child try the knit stitch. 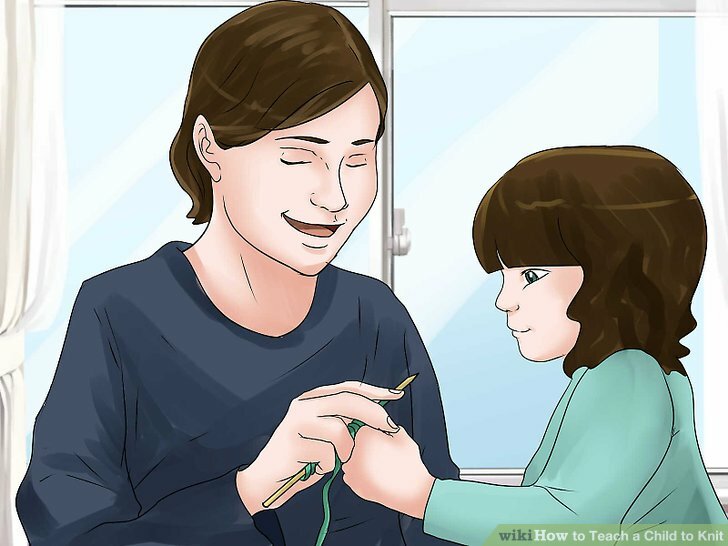 If the child wants to try knitting, hold the child's hands in yours so you're both holding the needles. Knit a few stitches together before letting the child hold the needles. 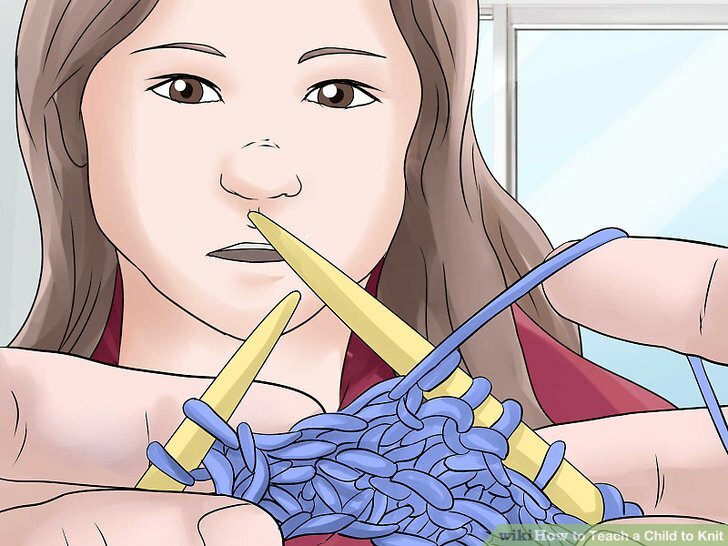 Encourage the child as they try to insert the needle and loop the yarn. If the child doesn't want to try to knit without you holding the needles, don't force them to. You can always take a break and try again later. 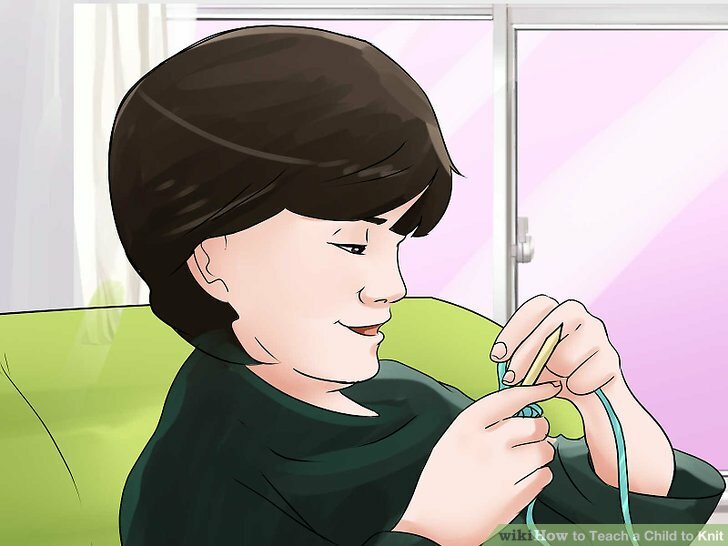 Show the child how to knit the purl stitch. Once the child is successfully doing the knit stitch without any assistance, show them how to do the pearl stitch. Instead of inserting the needle inside and behind the existing stitch, show the child how the needle goes down and in front of the stitch. Slowly knit 5 to 7 purl stitches with the child watching you. And off jumps Jack (Slide the old stitch off of the needle). Knit a garter stitch square with the child. Teach the child to garter stitch by knitting every row. Take turns knitting rows of stitches so you create a basic square. 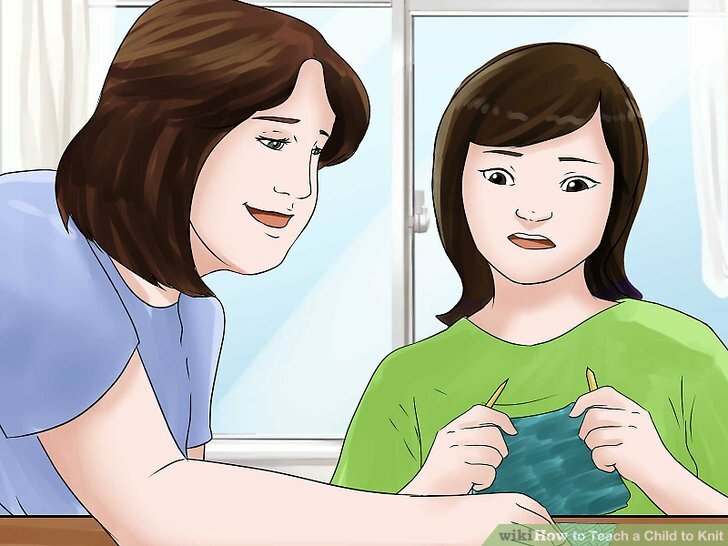 Knitting back and forth with the child will give you a chance to guide them and correct mistakes. The child can use the finished garter stitch square as a tiny placement, toy blanket, or rug for a toy. Show the child how to read patterns. If the child is at least 6 or 7 years old, show them what a standard knitting pattern looks like. Tell them what a few of the symbols and abbreviations mean. 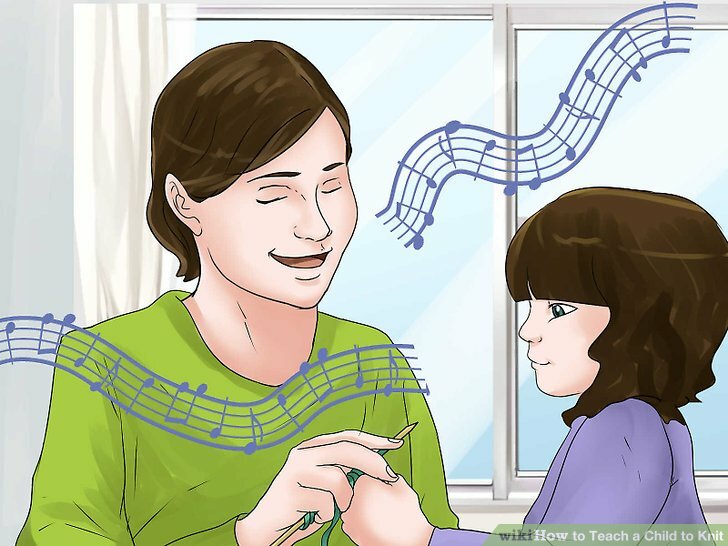 If you're looking at a pattern chart, show the child how to read from the bottom to the top. Don't worry if the child doesn't completely understand the patterns. If they're learning very simple projects, they won't need to rely on a chart. Select an easy project for the child to work on. Once the child is ready to work by themselves for a while, choose a basic project that only requires knit or purl stitches. Choose a simple design such as a washcloth, scarf, swatches, or a doll's blanket. Check on the child occasionally to see if they need your help. Ensure that the child can finish 1 simple project before moving on to another one. Help the child troubleshoot mistakes. It's inevitable that the child will make mistakes as they're learning to knit. Instead of simply fixing the mistake, show them they made the error and what you can do to fix it. The child will learn how to avoid that mistake and will understand that they can move beyond their mistakes. Be patient with the child. Children learn at different rates so follow the child's lead. 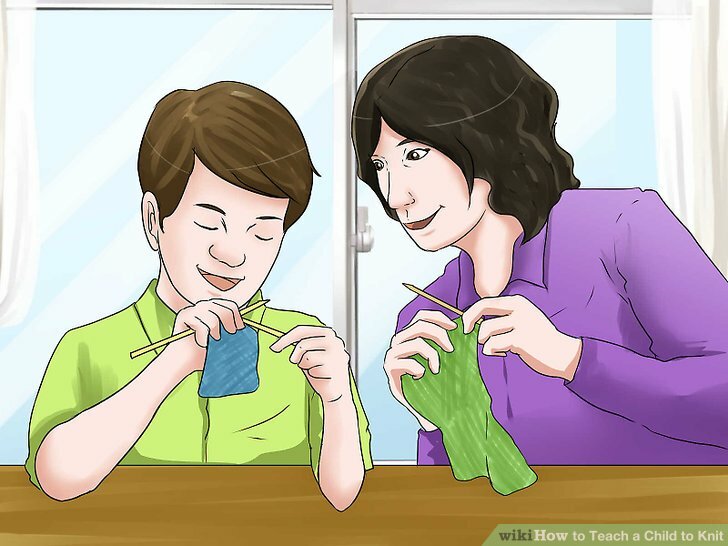 If the child is very interested in learning how to knit, they may pick it up quickly. Never force the child to practice knitting if they don't want to learn. Instead, help the child and instruct them when they come to you to work on stitches. Remember to encourage and praise the child's successes. Kids want to feel proud of their accomplishments and are more likely to stick with something if they feel supported.